PUEBLO –A Grand Opening and Re-dedication of the Colorado State University-Pueblo Occhiato Student Center (OSC), following a $34 million renovation, will be held at 1 p.m. on Tuesday, Jan. 23 in the building’s Great Hall. Among the speakers at the Grand Opening will be CSU-Pueblo President Timothy Mottet, Associated Students’ Government President Jake Harmon, project donor Mike Occhiato, and Architect Gwen Gilley, representing hord | coplan | macht. In October of 2015, the University broke ground on the renovation and expansion to the original 109,000-square-foot facility built in 1974. 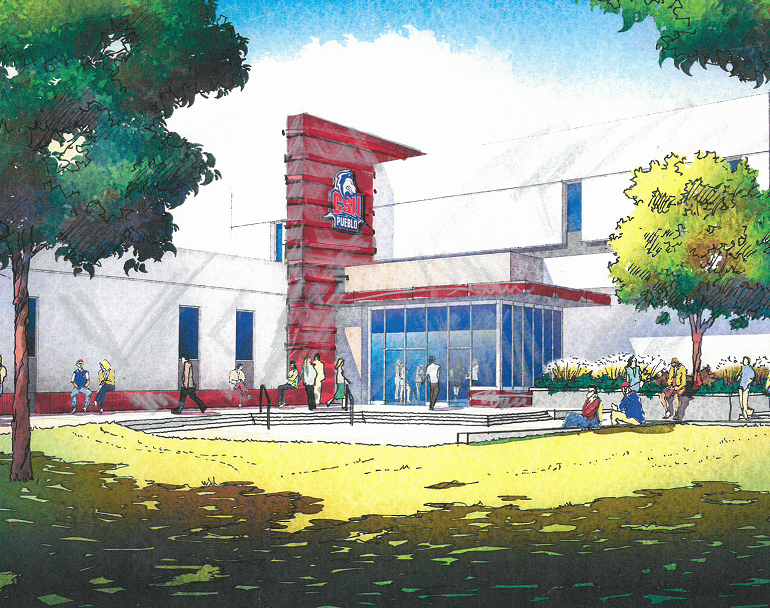 The 22,900-square-foot addition, which housed the University Bookstore and student cafeteria during the renovation, will feature a new ballroom and pre-event gathering space that will be unveiled officially as part of the President’s Gala on May 19. Attendees at the January ribbon cutting and open house will be able to view historical photographs of the building in order to appreciate the drastic changes. 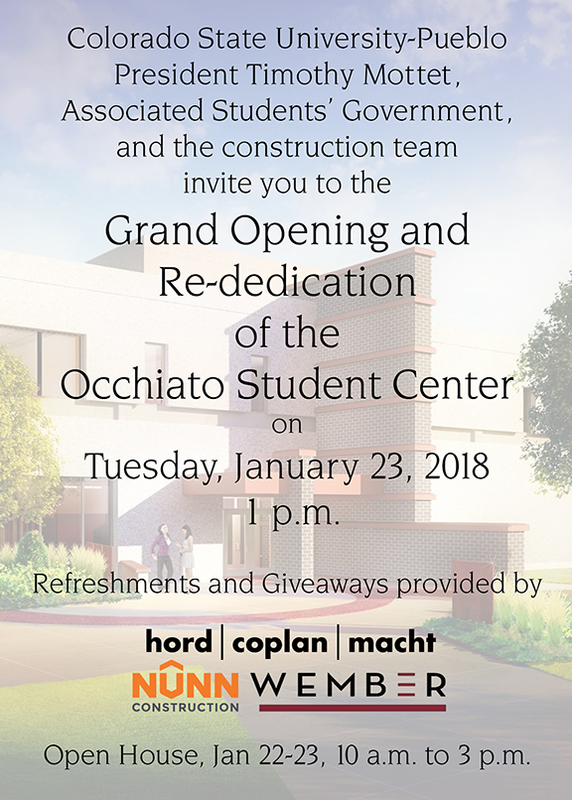 The University is renaming the building from Occhiato University Center to Occhiato Student Center to pay tribute to the significant $30+million commitment the student body made to the renovation through student fees. The building now is an open, dynamic, technologically-modern facility with residential dining and retail functions, study lounges, and state-of-the-art conference rooms. The renovation separated the student-use areas from the public areas available for public and private events. In keeping with the University’s commitment to sustainability, the renovated building was constructed to a minimum of LEED (Leadership in Energy and Environmental Design) Gold Standard. The OSC now has three different food venues. Located on the main level are Einstein Bros. Bagels, Tacos Navarro, and the Pack Café. Einstein Bros. Bagels is a neighborhood bagel shop which provides guests with freshly baked bagels, breakfast and lunch sandwiches, and Caribou Coffee. Tacos Navarro, a local Pueblo restaurant, serves freshly made to order tacos, enchiladas, nachos, the Monster Burrito and Tacos Ilegales. The Pack Café is an all-you care-to-eat dining hall which offers made to order hamburgers, a variety of pizza and sandwich options, and a daily special prepared by our executive chef. All three locations are open to the entire Pueblo community. An Open House will be held from 10 a.m.-3 p.m. both on Jan. 22 and 23, featuring tenants of the renovated building – Auxiliary Services, Alumni Association, Residence Life and Housing, Student Affairs, Dining Services and Catering, Military and Veterans Success Center, Bookstore, Office of Diversity & Inclusion, Center for International Programs, Associated Students’ Government, Student Organization and Leadership Resources, Student Engagement and Leadership, the Copy Center, and the Pack Pantry. A Great OSC Scavenger Hunt on both days will help familiarize visitors with the locations of offices and services, and participants will be eligible to win a variety of prizes from a television and computer tablet to meal plans and parking passes. Hunt forms and maps of the new facility will be available throughout the building, with forms due by 1 p.m. on Jan. 23 to the Auxiliary Services Office. Winners will be announced at the conclusion of the Grand Opening ceremonies. A student involvement fair and birthday celebration for the University ThunderWolf mascot, Wolfie, will be held in conjunction with the opening to include caricature and henna artists, photo booth, Wolfie plush creation station, and musical performances by string and jazz ensembles as well as a live remote by student-operated radio station Rev 89. Photographs with both Wolfie and live mascot, Tundra, also will be available. A cake in the shape of the renovated building will be on display and served as part of the refreshments. Commemorative items have been provided by members of the construction team – HCM Architects, Nunn Construction, and Wember.